So what do you need to understand this: three separate pop-cultural facts, plus the phonological relationship between Darth and Garth. “Wayne’s World” was originally a recurring sketch from the NBC television series Saturday Night Live. It evolved from a segment titled “Wayne’s Power Minute” (1987) on the CBC Television series It’s Only Rock & Roll, as the main character first appeared in that show.The Saturday Night Live sketch spawned two films, and several catchphrases which have since entered the pop-culture lexicon. The sketch centered on a local public-access television program in Aurora, Illinois, hosted by Wayne Campbell (Mike Myers, the same actor from “Wayne’s Power Minute”), an enthusiastic and sardonic long-haired metalhead, and his timid and sometimes high-strung, yet equally metal-loving sidekick and best friend, Garth Algar (Dana Carvey). 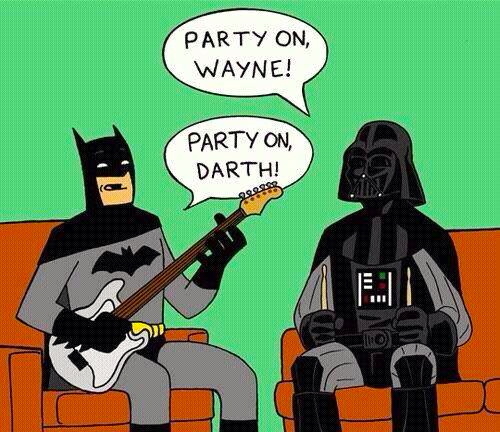 That gives us the formula “Party on, X / Party on, Y” and the name Garth. Darth Vader, born Anakin Skywalker, is the central character of the Star Wars [movie] saga, appearing as the main antagonist of the original trilogy and the main protagonist of the prequel trilogy. And that gives us the name Darth. Fact 3: Batman. Then there’s the fact that the Wayne character is obviously Batman — who’s Bruce Wayne in real life (well, in real life in the comics). This entry was posted on February 25, 2014 at 7:54 am and is filed under Language play, Linguistics in the comics, Pop culture. You can follow any responses to this entry through the RSS 2.0 feed. You can leave a response, or trackback from your own site.